As Halloween draws near, we thought it fitting that Common Core: IRL focus on scary stories. Be sure to visit the following blogs today to read reviews of frightening tales (both fiction and nonfiction) and see how they may be used in classrooms settings. Sometimes real life is more frightening than fiction, so today we're highlighting books from a terrifying event from our past: The Salem Witch Trails. Rosalyn Schanzer packs a lot into the 144 pages of this small nonfiction book for young adults. 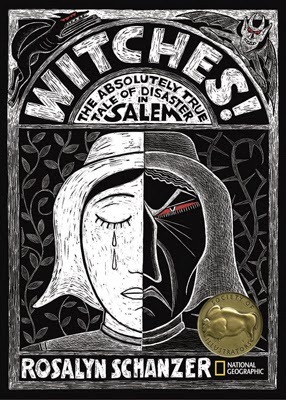 It is evident from the detailed story and the extensive bibliography that Schanzer meticulously researched the mysterious events from 17th century Salem. Chapter One, titled "Where the Stage is Set," provides background information about the Puritan religion and their beliefs about the Devil. The author ends the chapter by identifying three reasons why Salem's Reverend Parris was discontent with his current situation: he had not received the firewood he had been promised, he had not been paid his salary, and his daughter was sick with fits and seizures. His daughter's mysterious illness will prove to be just the beginning of a frightening and dark period in history when innocent people were accused, tried and hung for witchcraft. Witches! 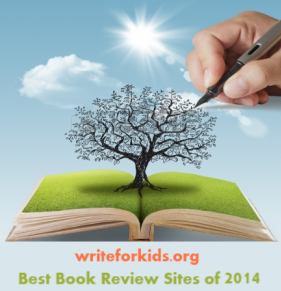 is a rich, nonfiction text to use with students for several reasons. Schanzer's description of the events coupled with excerpts from transcripts from the trials provide readers with sense of the severity of the accusations during the colonial era. The author effectively uses questions throughout the chapters to encourage readers to think and reflect as they read. Black, white and red scratchboard illustrations are fitting for this story involving beliefs about witches, the Devil and demons; the Caslon Antique font appropriately reflects the 1600s. Educators who use Witches! in literature or history class should ask students to identify the central ideas of the book and to develop theories about what caused the hysteria and the subsequent trials based on evidence from the text. Witches! could also be used to provide readers with historical context before reading fiction titles such as A Break with Charity or The Witch of Blackbird Pond. 7.2 Determine two or more central ideas in a text and analyze their development over the course of the text; provide an objective summary of the text. 7.8 Trace and evaluate the argument and specific claims in a text, assessing whether the reasoning is sound and the evidence is relevant and sufficient to support the claims. 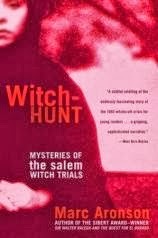 Aronson, always meticulous in his research, covers the same information as Schanzer does in Witches!, but fills out his detailed narrative with actual historical transcripts or notes taken during the trials. He outlines the events, and indicates key questions that historians over the years have also raised. Why did the good people of Salem cause nineteen people to be hanged and twenty-five more to die? Was it revenge? A silly teenagers prank out of boredom? Did the judge and the adults who attended the trials really believe the accused were witches? Aronson in his epilogue continues to provide insight in order to help make sense of current scholars differing views. In the appendix, Aronson believes that Arthur Miller’s play, The Crucible and its compelling portrait of the Salem trials was influenced by his experience with the House Un-American Activities Committee that blacklisted hundreds of people in the motion picture industry during the late 1940s. Other back matter includes a timeline, source notes, bibliography, and index. 9-10.2 Determine a central idea of a text and analyze its development over the course of the text, including how it emerges and is shaped and refined by specific details; provide an objective summary of the text. 9-10.3 Analyze how the author unfolds an analysis or series of ideas or events, including the order in which the points are made, how they are introduced and developed, and the connections that are drawn between them. 9-10.6 Determine an author’s point of view or purpose in a text and analyze how an author uses rhetoric to advance that point of view or purpose. 9-10.8 Delineate and evaluate the argument and specific claims in a text, assessing whether the reasoning is valid and the evidence is relevant and sufficient; identify false statements and fallacious reasoning. This book trailer of Witches! includes examples of Schanzer's scratchboard illustrations.